Represented as a dwarf with a large head, big eyes, protruding tongue and bow legs (sometimes also shown with a crown of feathers and a bushy tail). Unusually he was normally shown face-on rather than in profile - (as such he is often found portrayed on mirrors, ointment jars and other such items). 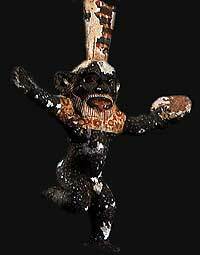 The very appearance of Bes was cause to give joy and good temper - his ugly looks were used to drive away evil spirits or bad influences, harmful reptiles, scorpions or similar type animals. The non-Egyptian look of Bes has led to speculation as to his origins - he was often described as 'Coming from the Divine Land' - which could mean from the east, or elsewhere in Africa, Asia or perhaps Babylonian. He could also be described as the 'Lord of Pwene' - which indicates his beginnings in the mysterious land of Punt. Perhaps Bes is most identified with his role as a protector of childbirth - when problems arose during a delivery a clay dwarf was placed on the head of the mother and a spell was recited 4 times calling upon the dwarf god to help (in the spell the god is described as 'Great Dwarf' with a large head, short thighs and as a monkey in old age. Bes was also present in scenes showing royal births - something which was especially true during the Ptolemaic and Roman periods. all the kinds of reptiles that attack in their caves"
In the Greek Period of ancient Egyptian history, there was a dramatic increase in the amount of images of Bes - both in numbers of amulets, figurines and so on, but also in the amount of large scale reliefs (he appears in the temples at Dendera and Abydos for example), this period also saw Bes elevated to the Egyptian Pantheon alongside the 'Great Gods'. At the funerary temple of Seti I in Abydos oracles would sit and ask Bes questions on behalf of the people - this may have included questions about dreams, but more likely questions people would have about their lives (whether they would get married, would they be sick, would Bes have a look at their money matters ...) - these questions would be written down on papyrus and left for the oracle.